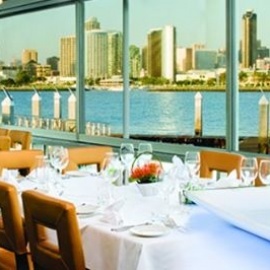 Nestled on the water's edge in the Coronado Ferry Landing Marketplace, newly rennovated Peohe's offers breathtaking views of the downtown skyline & San Diego Bay, not to mention an exceptional menu & warm hospitality. 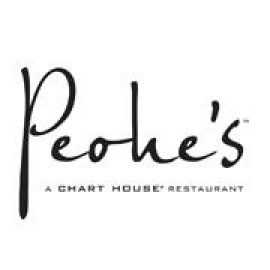 Specializing in fresh tropical seafood dishes influenced by Pacific Rim flavors, Peohe's also boasts a superb sushi bar featuring innovative rolls & new wave sushi creations. Original, unique décor starts with a splashing waterfall greet visitors at the entrance. Once inside, they dine elegantly in tiered seating, which affords a bit of privacy & allows guests to fully enjoy the view through floor-to-ceiling windows. Al fresco dining is also available on the patio or in the charming dockside courtyard. Travel to Peohe's via car over the scenic Coronado Bay Bridge, take a ferry or water taxi or moor your own vessel at the public dock. While we're excited to hear from you, it's important to note that fan postings to the Peohe's fan page are not representative of the opinions of Peohe's or Landry's, Inc., nor do we confirm their accuracy. Aloha, and welcome to Peohe’s (Pee-oh-ees), Coronado’s tropical island getaway!